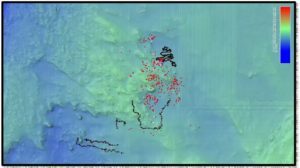 At least one primary battle zones for the Battle of the Egadi Islands was discovered during the 2010 field season and its exploration continued during the 2014 field season: sector PW-A. The finds were concentrated in a large area and included: bronze warship rams, bronze helmets, amphoras, and tableware. It is clear from the number of finds and their extent in total area that it will require many field seasons to map and collect the artifacts. ROV verification during the 2010-14 field seasons confirmed a concentration of objects that have both spatial and chronological association. The remains include: Greco-Italic V/VI type amphoras, Punic amphoras, bronze helmets, tableware, and bronze warship rams. The artifacts in this concentration lie within an area of around four square kilometers. The area has not been completely examined, and wherever ROV verification has taken place artifacts are present. The entire area may also continue further to the west; examination to the west indicates the presence of artifacts, but possibly in a lowered concentration. It may also be the case that the finds continue to the northwest and southwest as a high concentration was encountered in this direction during the season. It is nearly certain that dragging to the east of this artifact concentration moved the Egadi 2 ram and the Greco-Italic amphoras from here to their find locations c. 6 km to the north, and resulted in the collection of the Egadi 7 ram. During the 2014 field season the area of sector PW-A was expanded in the northeast and southwest directions (black track areas in map below). This effectively increased the site dimensions to one that is roughly 4.5 x 3.5 km. Moreover it now necessitates that all of the areas in between must be surveyed completely for finds. 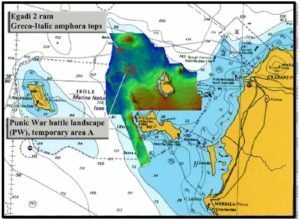 To this end the AUV option will continue to be explored as it will provide the most efficient method for covering large areas. It is likely that more rams are present to the west and southwest. 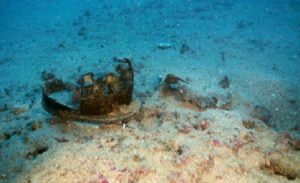 During ROV operations a ram discovered during the 2012 field season in the PW-A area (Egadi 10) was excavated and raised. An attempt was made to recover the Egadi 10 ram in 2013, but too much excavation was required for the time remaining in that season. In the 2014 season the entire sediment area around the ram was excavated and artifacts recovered. Intact ram located in the northern sector of PW-A. The ram was discovered in 2012 in a state of nearly complete burial that made it impractical to attempt lifting that year. Upon return to the site in 2013, there was a small reduction of sediment around the ram, but significant excavation was necessary. Excavation during the 2013 field season exposed more of the ram but did not allow the lifting of the artifact that year. During the 2014 field season, significant excavation was undertaken in order to safely prepare the ram for lifting and it was raised on July 2, exactly two years to the date of discovery. Several artifacts were removed from within the ram’s inlet prior to raising to ensure they were not lost during recovery. After recovery of the Egadi 10 ram it was clear that it belonged to the set of rams already recovered from the site (Egadi 2-11) in its general shape and dimensions. The decorative feature of a Montefortino helmet with three feathers matches that of the Egadi 7 and 8 rams, as well as the inscription naming a Quaestor responsible for some unknown aspect of financing. 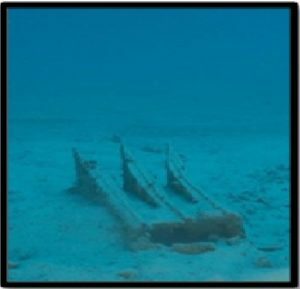 The ram had clearly been upright for some time early in its depositional history as there was some growth on all areas; however, after falling onto its starboard side and becoming buried the growth did not accumulate on the buried portion. The heaviest growth was on the port side, both interior and exterior. Most of its attachments were in place and not deformed indicating that the ram was deposited while attached to the warship; this is consistent with the Egadi rams as well. Wood was also noted inside the ram along the wale pockets and near the head where the ramming timber would be located. Samples were taken for analysis. 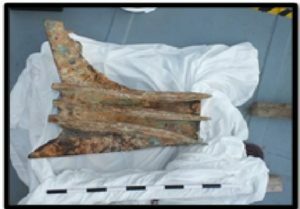 A large copper nail with no corrosion was located within the ram, and within the matrix of material that appeared to be rotted wood. On the inner-face of the cowl was a graffito that was clearly made in the original wax mold. 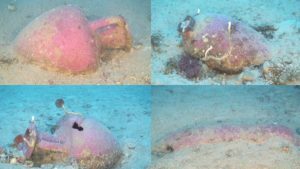 Although no helmets were raised during the 2014 field season, a new helmet was discovered 25 m to the south of the Egadi 10 warship site. The helmet is clearly a montefortino type with the majority of the dome missing. In addition to the helmet, there was a bronze object lying adjacent that also appears to be damaged. It is difficult to ascertain what this piece is, and it, along with the helmet, is slated for retrieval in 2015. During ROV operations, 65 amphoras (56 Greco Italic V/VI and 9 Punic of various types) were located on the seafloor; each had its position and depth recorded. This brings the total to 443 Greco-Italic amphoras (92.5% of total) and 36 Punic types (7.5% of total). Overall the Greco- Italic and Punic amphoras are in varying degrees of condition, yet 70.1% are complete and intact and 82.9% are complete intact or broken with all of the amphora is present. Three examples, all Greco-Italic V/VI, were raised for analysis.